This Kitchen really worth its own cooking TV Show! The kitchen is the heart of any home and this particular kitchen is 16 ft. long and is a perfect playground for a seasoned cook or aspiring cooking TV show host. It’s not just the size of the kitchen, but also the amazing contemporary features that are also spectacular. Concrete Countertops have gained a lot of attention recently. They are very flexible in design and implementation. It would not be possible to create seamless 16 foot-long countertops with other materials, like granite or other stones, just because a slab of this size would not be possible to transport or install safely. 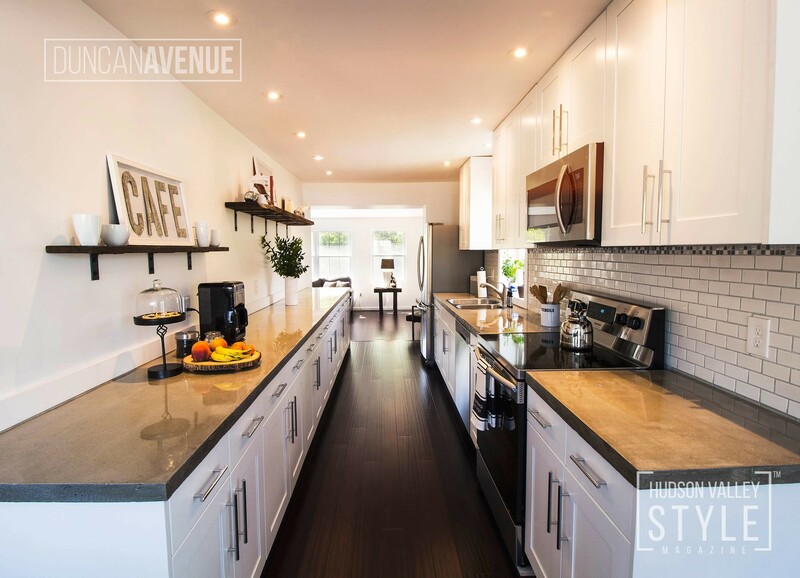 Concrete Countertops are durable, cost-efficient and much better for the environment, taking in account amount of energy required for production. Energy Star Stainless Steel Appliances are an important accord in an overall symphony of this amazing and very functional kitchen. They are positioned in the most efficient way to ensure an easy cooking process. We tried something different this time and went with an electric cooking range. Hudson Valley region energy providers now offer an option to switch to 100% renewable electricity from wind and solar, so the electric stove makes a lot of sense. We know how important lighting is anywhere in the house and especially in your kitchen, this is why we strategically positioned an extra window with amazing mountain views directly in front of the sink and energy efficient floodlights every 1.5 ft. above entire countertop space. With this amount of lighting, you are equipped to have a professional level of color and presentation control of your culinary masterpieces. The second floor of the Walnut Street House is the magnificent Master Bedroom that creates a completely private gateway from hustle and bustle of the main floor. Following grand staircase and surrounded by heavenly accent lighting it really feels like a castle in the sky. Vaulted ceilings, his and her walk-in closets and a dedicated reading/coffee table area makes the bedroom a true private Hudson Valley retreat in your home. After spending a night in a bedroom like this, one could why haven’t had a bedroom like this before? The Grand Master Bathroom is its own Spa oasis with particularly stylish floating vanity, spacious black granite counter top, vessel sink and a waterfall faucet. The modern style master bathroom features clean lines and appealing amenities that make it easy to relax and rejuvenate. The morning routine is a pure pleasure in a bathroom like this. 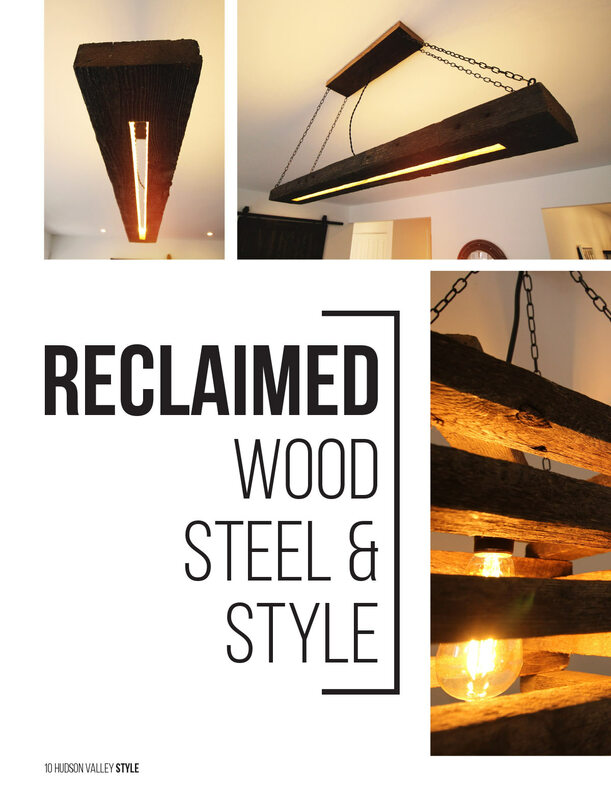 Be prepared to get inspired by the spectacular glass shower doors reflecting cove lighting and rustic reclaimed wood LED vanity light s, every time you enter the space. 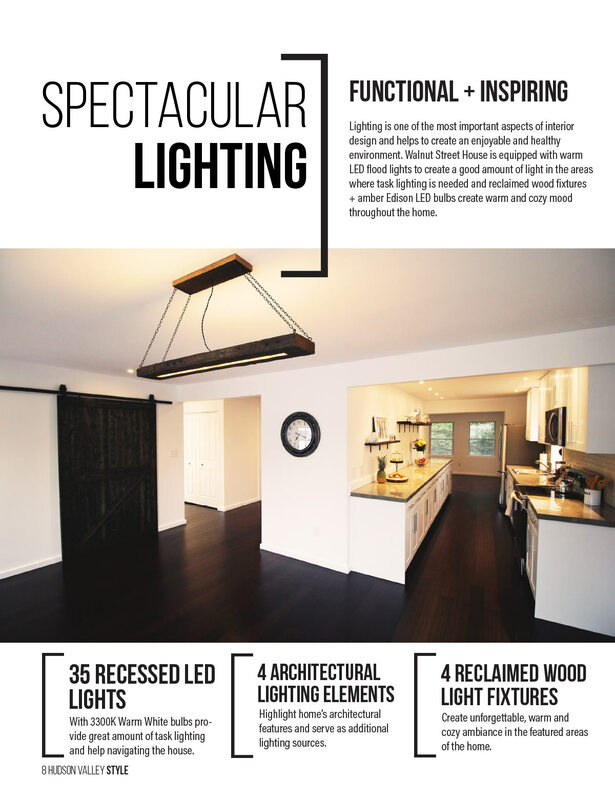 Lighting is one of the most important aspects of interior design and helps to create an enjoyable and healthy environment. 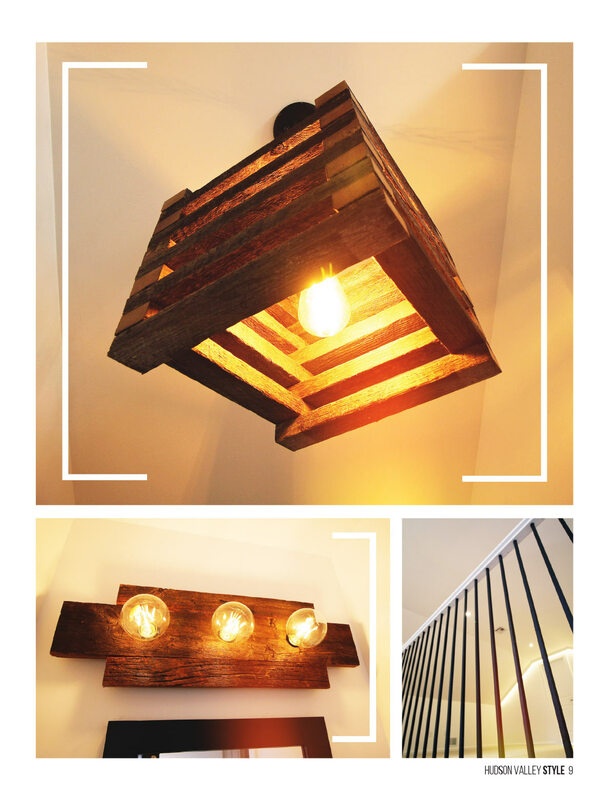 Walnut Street House is equipped with warm LED flood lights to create a good amount of light in the areas where task lighting is needed and reclaimed wood fixtures + amber Edison LED bulbs to create warm and cozy mood throughout the home. Yoga and Meditation Room on the lower level of the home creates an additional value and a unique indoor/outdoor experience featuring reclaimed red brick pavement and custom cedarwood counter and bar area. Yoga Room / Indoor Outdoor Space with brick flooring and custom cedarwood bar area for entertainment.